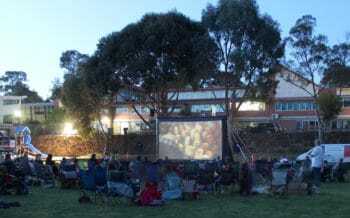 It comes to no surprise that school parents’ organisations love outdoor cinema. Watching movies together is a great way to entertain and engage your school community. Movie night is a great event which can be a major fundraising activity. It is easier to organise than a school fete, it is guaranteed to draw crowds and bring so much needed cash to your school. However, most P&C associations prefer to hire the outdoor cinema for the night. It costs around a thousand dollars to hire the equipment and the technician, but there is one little secret school mums and dads do not know. The reality is – they could DIY, without a hiring company, provided your school has a portable cinema. One person can set up an inflatable movie screen big enough for 650 people within 20 minutes! And all AV equipment is so easy to connect and operate that no technical knowledge is required at all. The only expense of the school committee would be getting the license to show the movie. To get the license, one needs to fill in the one page form obtained from Roadshow PPL or Amalgamated Movies. Secondly, pay the licensing fee, which depends on the size of the audience and your location. That’s all the effort required for a fabulous fundraising event! No matter how big is your auditorium – there are days when your audience is bigger. Information nights and graduation events may require showing videos, photos, and presentations on a big screen, so that hundreds of people would be able to see it. 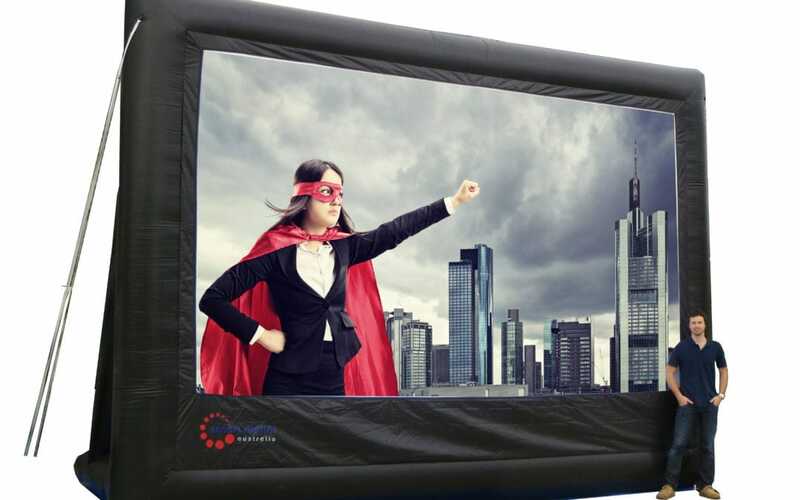 Portable movie screens give you the flexibility to choose the space where to run the event. They also allow to cater for a bigger audience for lower cost. The only factor you need to take into account is light. Even the brightest projectors will not be able to deliver decent picture if there’s a lot of ambient light around. So place your screen and projector in the darkest corner of your hall, turn off the lights, and let the show begin. Is it your annual disco for students? No need to invite professional DJ-s. Turn the portable cinema into a disco station – simply project pre-selected musical videos on a big screen, or play the music via the speakers. You can also show the slides of your choice on the screen – be it photos of the students, or presentations and projects made by students. Holding events or sports activities outdoors or in a big hall? Save your staff’ vocal cords with a portable PA system, which happens to be a part of the portable cinema package! A pair of speakers together with a lightweight and portable multimedia control system allows making announcements and playing music from USB, smartphone, or laptop, wherever you are. 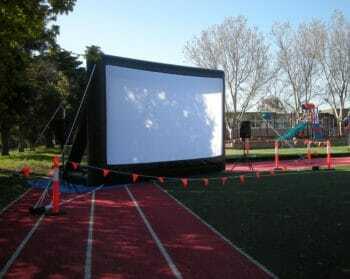 For starters, teach students how to set up and run an outdoor cinema event. This could be a great project, which could even give students some budgeting and event management skills! Secondly, movie making will be more fun if the freshly made films could be projected to a big screen! Projector supplied with a portable cinema is over 3000 ANSI Lumen bright, which is just right for any standard screen (90-100”) in a lit room. The projector does not have to wait idle till your next movie event – use it all year round in the classroom! Say “Thank you” to your community – students, parents, and teachers, with end of the year party and a movie night. Easy to organise, this event can coincide with Christmas celebrations, and is a great way to get everyone together for a beautiful celebration. Smart Digital Australia is an ASCA recommended supplier for portable cinema systems. We are proud to support Australian primary and secondary schools, providing them with portable projection screens, PA systems, and portable cinema equipment. Contact us today to find out about our exclusive offer to schools.